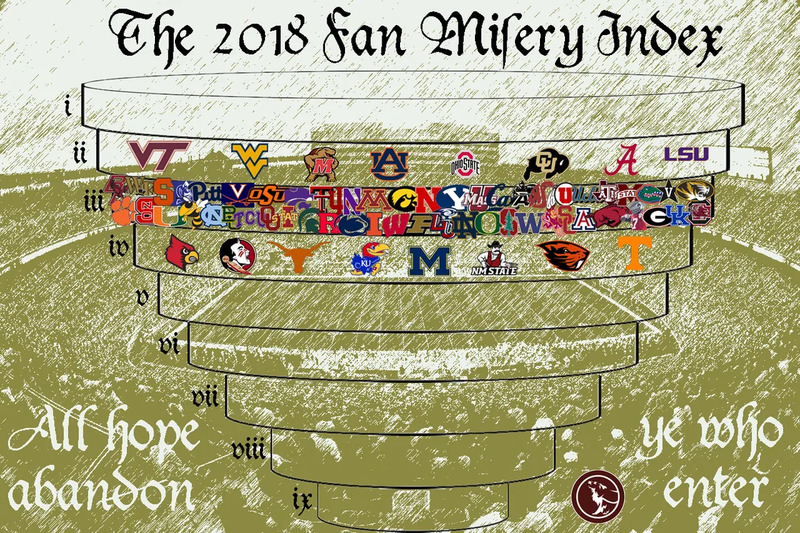 The Fan Misery Index (FMI) uses a simple integer scale of 1 to 9 to measure how much suffering each teams fans are experiencing through the course of a season. 1) Generally speaking, fans of good teams are just as miserable as the fans of bad teams. This is because of Football Satan’s right-hand man, a foul demon known only as “Expectations”. 2) Football is pain and the base emotion is misery, so all teams start off the season in the Third Circle. This site is only tracking P5 teams, so I will do my best to track our conference. If you have any suggestions to tailor to our level, let me know. We start at Level 3 out of 9. The higher the number, the more miserable we are (think 9 circles of hell). Rice lost to Houston. Down a level. Sorry, I have no idea what to do with the Texas schools. Also considered WKU vs MTSU, but then wouldn't know what to do with Marshall. (09-05-2018 08:52 AM)loki_the_bubba Wrote: Rice lost to Houston. Down a level. You didn't lose by 21 or more though! NT beat SMU. Should go up a level. So if UNT and Rice already have rivals, would they not have conference rivals, and then UTSA vs UTEP would be their rivalry? I suppose that works, if that's the answer. (09-05-2018 09:01 AM)odu09 Wrote: So if UNT and Rice already have rivals, would they not have conference rivals, and then UTSA vs UTEP would be their rivalry? I suppose that works, if that's the answer. I think you can have more than one rival. Everyone hates losing, but sometimes you extra hate losing to that team. I think for most North Texas fans the games they would absolutely be disgusted losing this year would be SMU and UTSA. Rivalries can change over time. I think in the early SBC years MTSU and NT had a pretty good rivalry going on. I think if LaTech and NT keep finishing at the top of the west that can develop into a serious rivalry. We should be level 10. No other team in the nation is experiencing the torment of our football program. Can we scratch the rival component? We'll never settle on who-is/who-isn't. Also, what if you meet more than 1 criteria to move down? For example, a FCS team beats you by more than 21 points. I agree. I used to look at Middle Tenn as our main rival in the Sun Belt. That seemed to change towards the end once Middle's actual rival joined the conference. That being said, I do feel a certain affinity/respect for them given our shared history and overall school similarities. One good thing that CUSA has provided us is enough schools within close geographical proximity to truly dislike and build rivalries against. (09-05-2018 09:32 AM)va-eagle Wrote: Can we scratch the rival component? We'll never settle on who-is/who-isn't. Then you would move down twice in one week. UTEP narrowly avoided that. The only possible in conference rival for Rice would be UTEP. We've played 21 times. Wikipedia and most of our fan base will tell you that we have 2 rivals: SMU & UTSA. We hate SMU and we are still mad at UTSA for 2013. UTSA is mad at us for embarrassing them last year. It is a young rivalry, but it is interesting. This thread also looks like a good place to revisit the classic Dante's Inferno show from the MOB. (09-05-2018 08:53 AM)odu09 Wrote: Sorry, I have no idea what to do with the Texas schools. Also considered WKU vs MTSU, but then wouldn't know what to do with Marshall. Does the rival have to be a conference school? The original poster said NT-SMU was a rival. The historic universally-hated rival on Marshall’s schedule is Miami of Ohio, who we defeated in week 1. Also, I’d argue a school could have more than 1 rival. In 2020, we play both Ohio and ECU in the same year. EA Sports has Ohio, Miami, ECU, and WVU listed as our rivalry games in the last version of NCAA Football on game systems. MT should automatically be at a 9 given our extreme dissatisfaction with the program. If that's accurate then I'll add it. I am relying on the fans of the schools to let me know which schools are rivals. If M-OH is a rival then I'll bump you up with UNT. Do you all think I should change it from "Beat a P5 school by 21 or more" to "Beat a P5 school?" or should I keep the same format as the P5 has it?